Supergirl is a solid show and brings a different perspective to the Superhero world from its sister shows. While I still see the storyline as a work in progress, Supergirl has a solid cast and an understandable plot that has a lot of steam left. DC has had a very big year with girl power and has proven that it knows what the audiences want to see from its women Superheros and as I repeatedly mention in my reviews, Warner Bros. really knows how to take a story and hit it right out of the park. Filling in a much-needed niche of female lead characters, Supergirl provides a rich superhero story and shows that being a Superhero is not only not all fun and games, but has some serious consequences when it comes to trying to be just a normal, run of the mill working girl. Supergirl entered its second season in the Fall of 2016, and with the new season came some new characters, some new storylines, and a new love for Kara Danvers/Supergirl (Melissa Benoist; The Longest Ride). Calista Flockhart (Ally McBeal), who plays Cat Grant and Kara's boss has left CatCo Worldwide and soon thereafter, Kara also decides to turn in her pen and join the DEO full-time to work with her sister Alex (Chyler Leigh; Grey's Anatomy) and Martian Hank Henshaw (David Harewood; Doctor Who) so she can be Supergirl during the day and save the world. While in Season One we saw the development of Kara becoming Supergirl and dealing with who she really is, Season Two brings Kara/Supergirl more into the central line, moving her from a Superhero observer to a Superhero do-er. We are introduced to more extraterrestrials, all of whom seem to spend a lot of time at a local bar. The Luthers play an integral part of Season Two, as Kara becomes friends with Lena Luther (Katie McGrath; Jurassic World), Lex' sister, and they form a special bond. The question is- can Lena be trusted? Surely, with Lillian Luther (Brenda Strong; Fear the Walking Dead) making a play for her estranged daughter and being behind a lot of atrocities happening to Kara and Alex' father, there must be more to Lena than meets the eye. Chris Wood (The Vampire Diaries) portrays Mon-El the Daxam Prince who falls in love with Supergirl. Lucky for him, Supergirl falls pretty hard for him until she finds out that he lied to her about his background. I guess the whole- your people killed my people thing- isn't a solid basis for a relationship! Regardless, I liked that the romance was kept "real" with issues that adults could relate to, even though the issues were really from outer space. Mon-El and Supergirl work through those issues in a very human way and all I can say is that Supergirl's writers clearly drive the point home that when you truly love someone, you will even sacrifice yourself for them. Supergirl's casting director chose well with the cast. Not only did they have a solid regular cast, but they have brought in some familiar faces to bring Superman and other DC favorites into the limelight. Casting Lynda Carter (Wonder Woman) as President of the United States (and an alien) was novel and a huge plug for DC's Wonder Woman movie. It also brought another powerful woman into play. Using Teri Hatcher and Dean Cain (both- Lois & Clark: The New Adventures of Superman) to play Mon-El's evil mother and Kara Danver's father, respectively, we see beloved actors in new roles but bringing those of us who grew up in the 90's back into the world of Krypton. The Blu-rays are presented in 1080p HD resolution with an aspect ratio of 1.78:1. The special effects pop whether it's a natural lit scene or an evening scene. Details are clear and when the concrete breaks or something explodes, you can see the details as real looking as a tree. The colors are bright and natural and I appreciate the natural tones presented in Supergirl throughout the season. The audio is presented in DTS-HD Master Audio 5.1. For a television show, this is appropriate, although I do think that Supergirl can handle a step or two up without being overpowering. Nonetheless, background noise is to a minimum and the dialogue can be heard clearly without straining. Sound effects are well placed and I like that when Supergirl is in the Fortress of Solitude, it seems like there is a slight echo, which is appropriate and makes me feel like I am in the middle of an ice cave. The special features can be found on the Blu-ray. Five new featurettes (Supergirl: 2016 Comic-Con Panel, Supergirl: Alien Fight Night (found on Disc 1), "Supergirl: Did you Know" Facts for Fans, Supergirl: Aliens Among Us; and A Conversation with Andrew Kreisberg and Kevin Smith) provide some new insight into Supergirl. In addition, the Blu-ray Disc 2 also has a Commentary with Andrew Kreisberg and Kevin Smith on Supergirl Lives (Episode 9). Supergirl is a solid show and brings a different perspective to the Superhero world from its sister shows. While I still see the storyline as a work in progress, Supergirl has a solid cast and an understandable plot that has a lot of steam left. If you are in anyway a Superhero fan or have a young girl in your home, Supergirl: The Complete Second Season is a great way to foster her independence, creativity, and show her how to "fight like a girl." 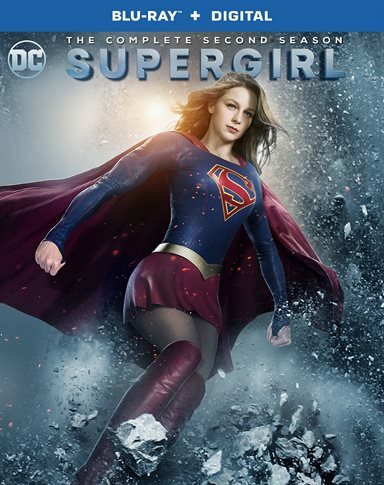 Download Supergirl: The Complete Second Season from the iTunes Store in Digial HD.